Why Do File Sizes Matter? This is a 36.2MP file and the size is 6252 x 4912, my camera's RAW file size. I’ve presented information about working with the Print Module in LR in another section of this site, but there are a few other things you need to know about printing in general. I really am not good at math and my head sometimes spins with all this, but it’s a must to learn to get your images to turn out the way you want them to when printed. I cannot even recall how many times someone has shown me a sharp photo on their iPad or phone screen and then said they had to crop to a very small size to get the subject big enough to actually be seen. This usually works OK for a digital photo being viewed in a small size on an electronic screen, but normally results in a poorly printed photograph since so many pixels have been removed: pixels equal information in the file; more information contained in the file equals a higher quality outcome when printing. Cropping deletes image information, actual pixels, and creates smaller files, which can only then be printed in a small image size. When you crop a photo way down you lose pixel information that is needed to obtain a sharp and clear printed product. When cameras are sold they come with a megapixel resolution, like 12mp, or 25mp, it depends on the camera and brand. This really does mean something, at least to the people who made the camera and assume that you want to produce the finest print possible. 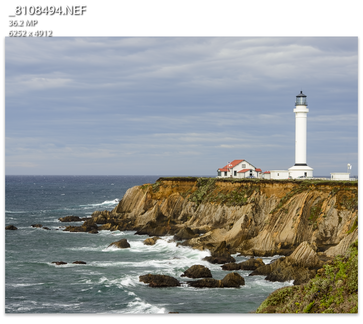 The megapixel resolution of your camera determines how large you can make a print, this is not to say that you absolutely cannot make that print larger, because you can if you know what you are doing in Photoshop or have software that does this for you. Even in LR you can do this, as LR re-configures the photo pixels for you when you ask it to print a photo that does not contain enough pixels to print at the size you requested: but has limitations. Every camera allows you to set different settings for file sizes. Check your camera manual carefully to see what file sizes and what file types you can set your camera at. Do this prior to leaving the house for your photo shoot so that as you take photos you get the file size you wanted. Most cameras allow, at a minimum, different sizes of JPEG files. Many cameras today allow allow for RAW settings and TIFF settings. All cameras allow for JPEG settings and most allow you to set a Small, Medium, or Large file size. In my D800 taking a photo in RAW and taking a photo in JPEG-Fine (Large) creates files that are both 7360 x 4912 and thus I can print the same size print from each file type, as the file type does not affect the size of the JPEG file, that is only affected by what file image size I’ve selected, i. e., Small, Medium, or Large in JPEG. The file size is what affects how large you can eventually print out your file to achieve a quality print. In RAW the file created is the maximum file size possible for your camera. I would recommend always shooting in the largest file size possible when in JPEG as you can always create smaller file sizes as needed when exporting from LR. Let’s use the Nikon D7100 (called a DX image sensor in Nikon talk), a cropped-frame camera that has a 16.2 megapixel resolution for an example. What does the 16.2 megapixel resolution, aside from 16.2 million pixels, mean to you as you print? It means that all of your images will have a specific size at which they will print correctly, depending on how you set the camera image size. This pertains to all cameras. Every camera manual includes information on best size for printed files. Your file dimensions and print resolution are key in figuring out how to print the correct size quality photograph, and the largest file size always provides the largest number of pixels and the best output in larger sizes, in this case the file size that is 4,928 x 3,264 pixels. You can always print to a smaller size and retain quality. Let’s say you want to print at 300ppi (it’s ppi-pixels per inch, not dpi-dots per inch which is a non-digital printing term). Yes, you could choose a lower resolution, like 150ppi, if the print is going to be poster-sized, but normally accepted print resolution for most averaged-size prints is 240ppi to 300ppi. So, divide 4,928 by 300 and this equals 16.42 inches and then divide 3,264 by 300 and this equals 10.88 inches. You can obtain a high quality, good resolution print of 16 by 10 inches or 17 by 11 inches or so, maybe somewhat larger, with this file size. It’s that easy to figure it out. I usually just divide the smallest side and then I know if I can print at the resolution and size I want. In LR you can set your files to show the size of the file automatically in View>View Options in two different overlays, you can toggle these with "I": if it does not show up automatically hit Command+I and it should then show up at the top left of each photo (you set this in the View>Loop Info menu). LR will up-size your photos if you want them larger but you will lose quality so check a photo carefully if you are pushing the size as it may lose pixels and quality. If you want to print out a larger size use the 240ppi resolution and that, too, should give you a fairly good print if you are not printing out too much larger of a size than the file can reasonably handle. What if you wanted to take a photograph and print it out at a size of 16 x 20 (not a digital size so cropping might be required), how would you figure out what size digital file size was needed? The formula is: (Size) x (print resolution) = print size. To obtain a quality print you would need a file size of 4,800 pixels by 6,000 pixels. You could use a lower resolution, but not lower than 240ppi in most cases, to help you obtain the file size you need if your camera will not produce a file size this large. To obtain a quality print you would need a file size of 3,840 pixels by 4,800 pixels. The quality may be slightly less than the larger file size. What if you wanted an 11 x 14 print? This size is not a digital size and in order to get that size from a digital print you would need to crop the photo to 11 x 14 (cutting off one or two sides). However, 4 x 6 is a digital size. Digital sizes, from a 3:2 ratio camera, have nothing in common with 11 x 14 or 8 x 10 sizes. Look at the numbers in the ratio, 3 and 2. Start by adding 3 to the 3: thus, 6, 9, 12, 15, 18 inches on the one side. Then add 2 to the 2: 4, 6, 8, 10, 12 inches on the other side. So, a 3:2 digital print is 6 x 4, 9 x 6, 12 x 8, 15 x 10, and 18 x 12.